Located in LACMA’s Resnick Pavilion, where I previously saw “Bodies and Shadow: Caravaggio and His Legacy” (reviewed here) and part of the museum's James Turrell retrospective (reviewed here), “Calder and Abstraction: From Avant-Garde to Iconic” is a pleasing, breadth-heavy look at the artist as he made the titular transition from avant-garde artist to icon and to institution. In general, the balancing act that each Calder work pulls off is always enjoyable. There is nothing quite so right as that dash of red amidst the elegant black and white of his classic mobiles. (I previously reviewed a Calder-centric exhibit at the Orange County Museum of Art, located here). LACMA's relatively new Resnick Pavilion is a building that has been hit-or-miss as an exhibition venue in the past. While the two smaller side galleries are more optimally designed, the central gallery is awkwardly wide and requires significant work to make it an intuitive exhibition space for each show. Additionally, the central gallery is often plagued with increased background noise from all the foot traffic around the building. Luckily, with this exhibit, the space has been modified with only minimal dead space and manages to present the works on display in a logical way. The walls are, for the most part, painted a light gray, an inspired touch that offsets the largely white/black palette of Calder’s works. White walls would render the white metal elements of the pieces unremarkable; the one section where white is used as the wall color is judiciously done. “Calder and Abstraction” explores how the sculptor’s work changed over the course of his long career, spanning from 1931-1975. The earliest works on display were created in France, where Calder spent time with French Surrealists. These works are not what viewers would expect of Calder. They demonstrate a “reliance on chance” (according to the blurb) using perilously suspended spheres, or they create a playful dialogue between framing and subject, with hanging elements placed in front of a monochrome board. What is notable and often wonderful about Calder’s work is the way it engages the audience. Each piece, with its skeletal structure and projecting branches, is a hundred different pieces depending on where the viewer is standing and depending on how the breeze moves the piece. It’s why Calder is so popular—because every viewer sees it differently. Because the titles of Calder’s works are not constricting, every viewer’s interpretation of a work is legitimate. Much of modern and contemporary art has the effect of confounding or angering the viewer because it is not figurative or because its relation to its title is often hard to grasp. Calder’s works, on the other hand, are much more welcoming because there is no way to be wrong about or to be wronged by these delightful forms. Some of the works are small and delicate, while others are more dramatic and use unexpected colors and contrast of size. For example, “Orange Paddle Under the Table” (1949) contrasts small white branches on a delicate structure, balanced against one large oar-like component that hangs under a white table. The piece is quietly thrilling. For the most part, the pieces that most intrigued me weren’t the typical ceiling mobiles Calder is famous for. Instead they comprised what I observed to be altogether stranger forms with more unexpected colors such as orange or blue (instead of Calder’s typical red or yellow accents), or with wood. A delight were 1944’s “The Vine” and “The Snake”, two iron sculptures that provide an ounce of robustness amid the ethereal Calder we are used to. Like their namesakes in nature,“The Vine” and “The Snake” are full-bodied, sensual and curvaceous. Another highlight of the show is “Gamma”, from 1947, with its delicate treelike forms that almost conjure up a waterfall. Across it is “Bougainvillier” (seen above), also from 1947, which combines a black base with thin black projections that call to mind a lily pad or a flower with long stamens. “Constellation Mobile” (seen below), from 1943, conjures up both a solar system with groupings of stars as well as a toy dangling above a child’s crib. One last highlight is “Snow Flurry”, from 1948. Placed in an isolated section of the exhibit, it is a simple combination of white circles held together by black wires. The corner of the room is partially in shadow, so the circles get brighter or grayer as they drift aimlessly. This work easily conjures up the feeling of watching melting snow flurries drift downwards. 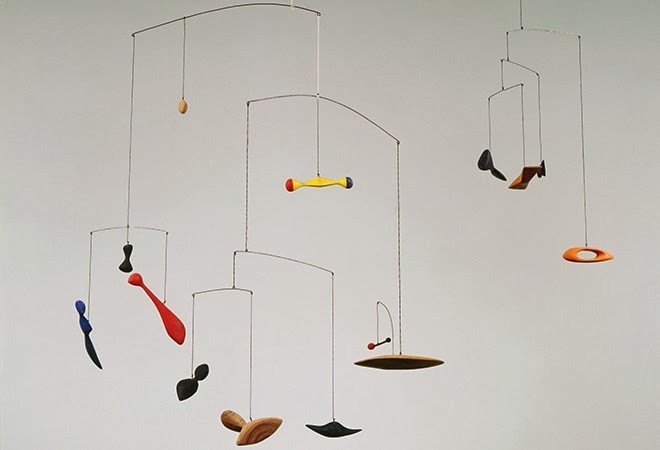 Alexander Calder, "Constellation Mobile", 1943. A small section carved into a partitioning wall juxtaposes photographs of some of Calder’s large outdoor works with the working models he created for them. In this vein, I would have liked to see drawings or notes reflecting Calder’s more intimate thought process. I would have wanted to see more of him working out a composition for a piece, rather than a model that closely predicts the final product. In this respect, I was a bit disappointed by the show. 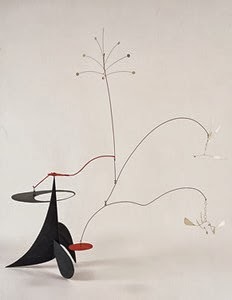 Since the emphasis was on Calder’s transition from “avant-garde to iconic”, I would have wanted more messiness and process from an artist we all know as exquisitely finished and ethereal. 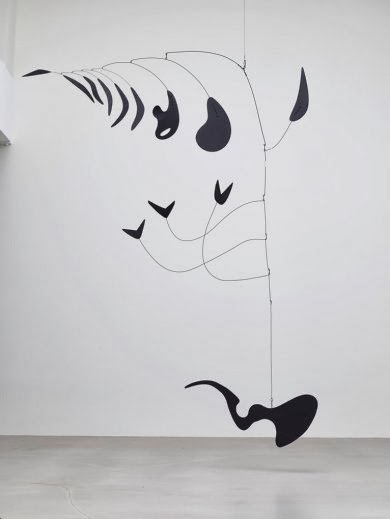 Specifically, what was Calder’s process and how did it change over the years? This show is heavy on the breadth of his career, but not on the depth. Some of the best pieces in the show are delightful and atypical, and I would have liked information about why they are different—why did he create works in some ways and then change his methods or materials? How did his works change after he became a household name? I recommend this exhibit highly for people who want more exposure to Calder’s works over the years, or for more casual fans. Its scope is impressive and LACMA’s prestige and power allows the museum to put on an extensive, carefully arranged show. “Calder and Abstraction: From Avant-Garde to Iconic” is on display until July 27, 2014.